The Illinois Sustainable Technology Center, a partner of the Illinois Wood Utilization Team, is inviting businesses to participate in an open house and demonstration of a boiler system fueled by low-value wood waste. The demonstration is scheduled for Thursday, Dec. 7 in Urbana. Come see for yourself how more of this under-utilized material can be put to use in place of propane and other heating fuels and at the same time reduce the need for landfilling. Read more about the wood waste boiler demonstration and learn how to RSVP in this month’s Illinois Urban Wood Update. Also, relax and check out a couple of videos focused on urban wood businesses. The first is meant to kick off a series of videos produced by TX Urban Sawmill, a new company in Austin, TX. The second video is actually Episode 2 of Wood-Mizer’s Urban Sawmilling series. The video profiles the father and daughter team that run Manayunk Timber in Philadelphia. Plus, see how Grand Rapids is promoting its urban forest through its annual Mayor’s Tree of the Year awards. Talk about writing a backstory for future urban wood products! If you got a story, photo, video, event, comment to share about urban wood, bring it on. I’m all ears! Read the November 2017 Illinois Urban Wood Update. Wood-Mizer presents Episode 2 of its Urban Sawmilling series, a collection of videos profiling companies advancing the urban wood movement. Episode 2 features Steve Ebner and his daughter Rebecca who run Manayunk Timber, an urban sawmill in Philadelphia, PA. Established in 1984, Manayunk Timber specializes in reclaiming old-growth, high-quality wood from 19th century Philadelphia buildings and offering local, sustainable lumber for restoration, renovation, custom woodworking and new construction projects. Learn more about Manayunk Timber. A demonstration of a waste wood-powered commercial heating system is scheduled for 10 a.m.- 2 p.m. Thursday, Dec. 7, at the Country Arbors Nursery, 1742 County Rd. 1400 N., Urbana, IL 61802. The open house and demonstration, organized by the Illinois Sustainable Technology Center (ISTC), is geared for those interested in learning about the potential benefits for heating agricultural buildings, schools, churches and other structures with wood and other biomass fuels. An estimated 1 million tons of renewable wood in Illinois could be used to displace the use of fossil fuels. Wood heating systems could be an attractive option in buildings currently using propane, and where sawdust and other wood wastes could be utilized, saving the cost of disposal. The ISTC, which is leading this project, is offering free engineering study assistance through the rest of 2017 to gauge the feasibility of this fuel in specific applications. Lunch will be served during the open house. Please RSVP to schandr@illinois.edu by Tuesday, Dec. 5. Devin Ginther and Aaron Mitchamore are co-founders of TX Urban Sawmill LLC, a newly-established company dedicated to salvaging lumber from felled urban trees in and around Austin, TX. Ginther is also owner of Refined Elements, a company that specializes in inspired natural design, live edge furniture, solid hardwood furniture and specialty lumber sales, including urban wood. Ginther said the accompanying video kicks of a series of urban wood videos that will be throughout 2018. TX Urban Sawmill’s motto is “Help us save Texas, one tree at a time.” The company has formed a partnership with Austin Tree Experts to help identify trees at the end of their service that have the potential to yield valuable lumber and is actively pursuing relationships with other area businesses that share the vision of repurposing urban trees as furniture and other wood products. The Fall 2017 Urban Wood Utilization webcast, hosted by the Wood Education and Resource Center on Oct. 10, is available for on-demand download. Highlights include updates of the Urban Wood Network by Don Peterson, and the new Virginia Urban Wood group by Joe Lehnen. 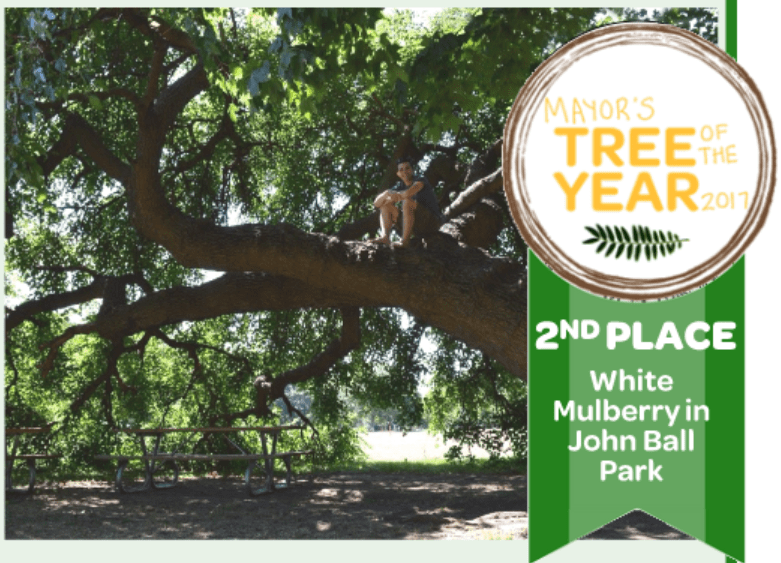 If you love hearing about urban trees repurposed as furniture and other wood products, then you gotta love the Mayor’s Tree of the Year program in Grand Rapids, MI. While the focus is clearly on saluting trees that are thriving, great back stories are being created in the process that will add tremendous value to the lumber these trees will – hopefully – yield when they must come down. The annual award program was initiated in 2012 by the Friends of the Grand Rapids Parks. The Arbor Day Foundation recognized Friends of Grand Rapids Parks for its launch of the Urban Forest Project, which includes a crowd-sourced map on which the public can plot the locations of trees. There would be a great tale to tell about any furniture or wood products made from this award-winning tree that stands guardian to a cemetery. Talk about full circle! The runner-up trees are no slouches. I hope Grand Rapids citizens will enjoy these trees for many years to come, but when the time comes that they must be removed, may their stories be cherished as future heirlooms for generations to come. 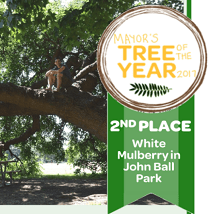 Read more about the 2017 Mayor’s Tree of the Year program. Every Urban Tree Tells a Story; Got One to Share? 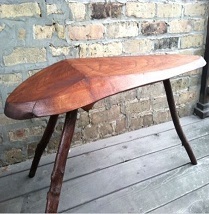 Oak/Cherry Coffee Table by Michael Dimitroff of the Chicago Park District. Many of the urban trees that get repurposed as lumber and ultimately furniture or other wood products have a back story. It may be the backyard tree that shaded a generation or more of the same family. Or it may be the tree in the park renown for snagging kites. There are as many potential story lines as there are urban trees. If you have one to share, we’d love to hear it. Simply send a photo or two and a short write up about the tree and how and why it was transformed into something of value for its second life. Even a handful of bullet points will suffice. We’ll do the rest and share your story with our audience on the IL WUT website and monthly Illinois Urban Wood newsletter. Direct your urban tree tale to Rich Christianson at richc.illinoisurbanwood@gmail.com. Let’s aspire to inspire others how to put urban trees at the end of their life to their highest and best possible use!